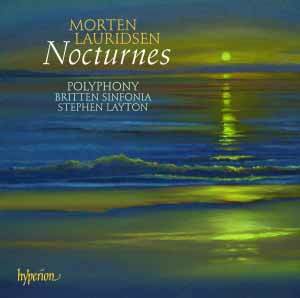 This follows on from Hyperion�s highly successful Lauridsen disc issued some two years ago (see review). Unlike its predecessor the present CD includes some first recordings which is extremely welcome. On the appearance of the earlier disc, I compared it with the American recording by many of the works� dedicatees, the Los Angeles Master Chorale recorded on RCM Records. As far as I am aware that superb disc is unaccountably still unavailable in the UK. With this issue, Polyphony show themselves the equal of the American Choir. The only difference is that Polyphony seem to be a smaller ensemble and as such do not command the same sonority as the larger body of singers. Still there are benefits in having a smaller choir and these include a superior response to some of Lauridsen�s cross-rhythms, where the lighter body of tone allows conductor and choir more clearly to articulate the texts without losing impact. Also, taken at a slightly faster tempo the performance is marginally more exciting. Make no mistake, this is a superb issue, with the engineers capturing the full sonority of the choir, orchestra and soloists to perfection and with diction being as clear as crystal throughout. There are four first recordings here, three of them being fairly short pieces, written in the composer�s easily assimilated manner. Two of them were written some time ago, and it is good at last to have them recorded here for the first time. The other two were both written in 2005. It is very satisfying to note that the composer has not lost his touch. The last work on the disc, �Nocturnes� is a three movement suite for chorus including piano in movements 1 and 3, with the middle movement being for unaccompanied chorus. The piano is here played by the composer, so I would suggest that the interpretation of the work by the conductor is likely to be accurate. The first movement is a setting of Rainer Maria Rilke�s �Sa nuit d��t�, the second turns to Pablo Neruda�s great love sonnet, �Soneto de la Noche�. In the third movement Lauridsen sets James Agee�s famous poem �Sure on this shining night�. Based upon the aural evidence he has created another very fine trio of pieces, and I am sure that Stephen Layton�s fine choir enjoyed working with the composer immensely. Do I have any criticisms � well yes, but nothing to do with the works themselves, performances and recordings, all of which are exemplary. It concerns Hyperion�s maddening habit of listing incomplete information on the back of the box, when they could just as easily print the full data as they do in the booklet inside. I refer to them only printing the first track of a multi-track piece rather than listing the first to last tracks, as nearly every record company does. I know this is fairly minor, but it is a personal annoyance, and I wish they would follow the example of other companies.